Echo Sparks have just released their debut full length Ghost Town Girl, the long-awaited follow up to their 2013 EP. The band was formed by DA Valdez, known notably for his work with The Pontiac Brothers. Echo Sparks is Valdez’s outlet to share his original songs with a wider audience. With the help of vocalist CC Kinnick,, the two started the venture performing at an array of venues in the Orange County area. Soon they added bassist Cindy Ballreich to the group, that has helped form their sound throughout the course of the past few years. 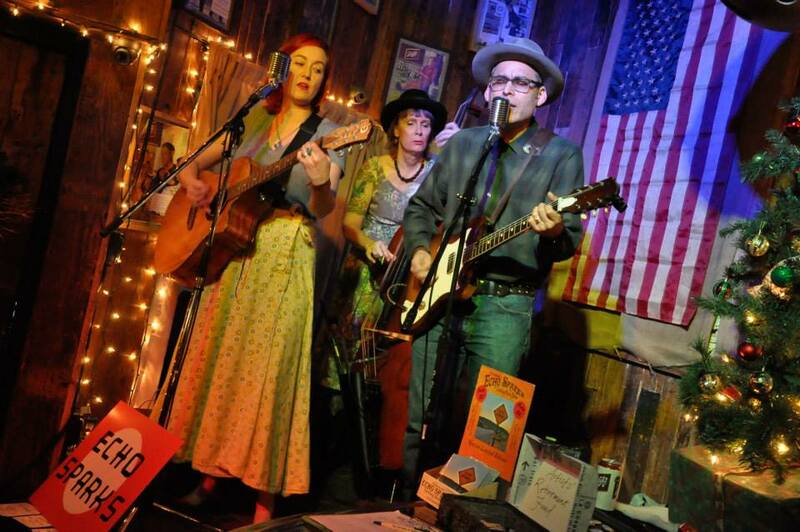 The group is graciously described as “A mashup of folk, rockabilly, old Mexico, blues and 1930s jazz,” which was enough to catch my attention in the first place. On the 10-song record, the group combines these conflicting sounds effortlessly. The male-female vocals that carry throughout the record are gorgeous with smooth and silky harmonies. Upon first listen the songs will captivate you. One of my favorites on the record is the stunning and vibrant piece, “Broken Arrow,” which opens the record. This feeling carries throughout in songs like “Princess of Fresno” and “Shallow Water.” Track after track the album is filled with incredible harmonies. The band really goes back to genuine folk and rock n’roll, bringing a whole new insight into the current state of music. From start to finish on this record, the band provides a noteworthy sound that is able to make them standout from what a lot of bands are creating these days. Their music is honest, heartwarming, and proves to be something magical and unique before the record even finishes. Their approach to making music is not new by any means, but why fix something that isn’t broken? I highly suggest Echo Sparks’ Ghost Town Girl to warm you up on these cold winter days. This entry was posted in Uncategorized and tagged echo sparks, ghost town girl. Bookmark the permalink.